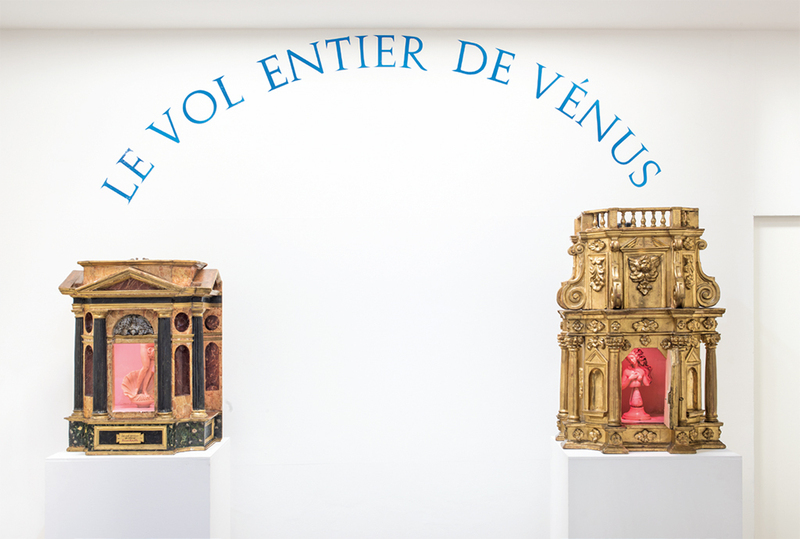 Luca Maria Patella, Le vol entier de Vénus (The Entire Flight of Venus), 1989, wooden tabernacles, Venus statuette, dimensions variable. The multifaceted artist Luca Maria Patella was born in Rome in 1934. Over the course of his long career, he has worked in various media, from film, sculpture, photography, and performance to object-related installation, not to mention writing, where his continual wordplay injects a strong measure of irony. Curated by Alberto Fiz, this small survey of Patella’s work from the late 1960s to the late 1980s originated at the Galleria Il Ponte in Florence, where it also included pieces tied to that city’s history. These examples of the artist’s “contextual” work were not, however, displayed at Galleria Milano, a venerable space with more than fifty years of history behind it, which has been directed since 1965 by Carla Pellegrini. Well versed in science, psychoanalysis, and, most evidently, art history, Patella plumbs the profound significance of images and the symbolic value of signs.